There are several things I want to write about following our trip to Montana. I could write about the 17″ rainbow I caught when no one had caught anything bigger than a 10″. I could write about a day fishing with my business idol and fellow tenkara angler, Yvon Chouinard. Or about the 1% for the Planet film we shot. But, as I reviewed photos of the 5 days we spent in one of the greatest fishing destinations anywhere, I relieved one of the saddest sights of the trip, and one that made me sad as an angler and a purveyor of angling. We had been fishing all day, hitting several different locations inside of Yellowstone National Park. Our last spot was on the Firehole, a river Yvon Chouinard said was the most beautiful river in the world and said we had to fish. It was an idyllic river, with some areas adorned with hot springs, and very clear water throughout. The evening session started at this new stretch at around 4PM. Fishing was slow, but we were hooking our share of trout here and there. There were 4 of us fishing this area, and we alternated between fishing together, and leap-frogging each other. As time went on I started gaining some distance from the others, getting pretty far upstream from them and finding my own waters. As I turned around the last stream bend of the day, I couldn’t believe my eyes. A bird was struggling about 10ft above ground, one step closer revealed he was trapped by fishing line! I had always strived to get my fly from trees as much as I could, avoiding breaking the line just because the fly was hard to get. Friends had joked that I would get hurt by balancing on top of wobbly rocks while reaching for flies that were hard to get. It wasn’t because the flies are expensive to replace, but rather because I was afraid one day they would trap wildlife and possibly kill something. One time, while fishing a stream in Utah, I kept retrieving line from other anglers that had been left on the trees lining the stream, I arrived back in my hotel with a handful of line that when compacted was the size of a baseball – that was a lot of line. Yet, I had never actually personally seen a bird or anything else trapped by fishing line. I rushed toward the bird, disturbing water and scaring all the fish in the next 100 yards of the stream, I’m sure. I had to act quickly. 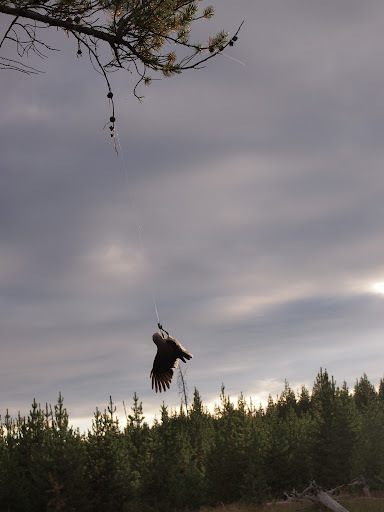 The bird was too high to reach, he was hanging in fishing line that was also too high to reach. I had to resolve this problem quickly, the bird’s life was at stake here. How could I get him off that line? My decision-making seemed to take an eternity, but within a second I saw the solution. I would reach my tenkara rod tip to the end of the branch, pass my line around the branch, pull the branch down with my line and save the bird. I stretched my arm up, and the tip of the 14ft 7 inch rod just managed to reach the branch. Never had I been happier to have the longest rod I could on a stream. I passed the line over the top of the branch, and lowered the rod so I could grab the line. The branch was stronger than I had expected. With one hand I pulled firmly on the line to lower the branch, afraid it could break anytime, with the other hand I struggled to reach the bird. The bird, scared as one would expect, kept flying up, staying out of reach for a few moments. But, tired, his flying didn’t last long, maybe 20 seconds. Within a minute I had the bird secured, cradled in my hand with the wings in a comfortable position. Two nymphs and over 5 ft of line. One nymph, size 16, was stuck on the inside of his beak, on the top part. I imagine the bird saw the nymph dangling from the tree and thought it was real food. Another nymph, size 18, had become stuck on his foot. The forceps came in very handy to remove the fly from his beak. Though park regulations require barbless hooks only, both flies were still barbed, though luckily the barb wasn’t very large. Line had become wrapped around one of his feet. I do not know how long the poor bird had been there, but the foot seemed to have become closed because of the line. Not wanting to cause him any more stress, I let him go. He flew to the nearest branch. His flight seemed to be okay, I was happy the wings had not been damaged. He had difficulty balancing on the branch due to his damaged foot, but eventually he settled. He puffed up as if to stay warm and stayed on that branch for the rest of the evening, recuperating. Behind me, the golden hour of fishing, the yumazume, the evening hatch, was happening. I didn’t notice them when I was saving the bird, but now that he was gone, big splashes were all I heard. Yet, I couldn’t look back. I stared at the bird, contemplating the fact that one of my kind had caused him pain. For at least 20 minutes I reflected on the fact that as a fly-fishing company I may have had a part on this, that I could be causing this type of damage to other wildlife. It felt awful. I was thankful for the decision to move all our flies to barbless hooks a few months ago (there may be a few barbed flies still in our inventory, but for the most part they are all barbless now). I was happy they were not tenkara flies. I was particularly happy I had been able to save him with the tools I had in hand. There is a little something I call my “karma-neutralizer”. Essentially I never mind getting a bruise or scratch here and there when I’m fishing, figuring those are my instant retribution for hurting a few fish. It’s better that they happen there and then, in small amounts, than all at once in the future. However, they are usually a “lose-lose” situation, where I and fish get hurt. I try to collect trash when I fish, to have a win for someone. This time, I felt like the action was a good karma-neutralizer. And, back to fishing I went. I’m not in Montana very often, and the sound and sight of rising fish were too much to bear. Though, I must say, I didn’t hook another fish that day. Maybe I just wasn’t trying hard enough. Please, next time you are about to lose a fly on a tree, don’t think about supporting us by buying more flies, try getting the fly to prevent this type of thing from happening. If you still have barbs in your flies, please remove them, you’ll lose many fewer fish than you think. BTW, that’s a Clark’s Nutcracker you rescued. Thanks Steve, was wondering what kind of bird that was. Good going Daniel. I’m sending you good karma via email my friend. Your story reminds me of the time Sherry and I did just the same thing for a bird caught in fishing line on a favorite golden trout stream. We placed the bird in the bushes to protect it from the elements and a week later I returned to fish it again. Unfortunately the bird did not survive despite our efforts. He’d been hanging in the line too long, I suppose, and shock took its toll. I’m glad your bird survived. All God’s creatures thank you !!! GOOD WORK Daniel! Upon more reflection, I realize that as anglers, being on the stream as much as we are, we are often in a position to help wildlife more than others. 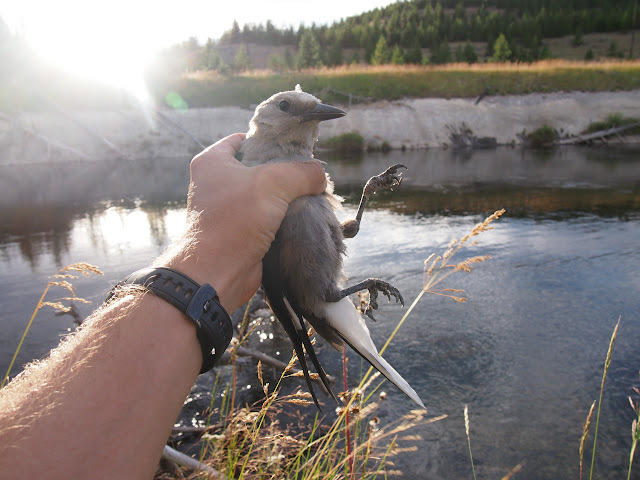 This time it was a bird trapped by fishing line, but other times we may spot poachers, pick up trash, see if anything else is going wrong in a piece of water, and in general just advocate for stream protection. I was happy to come when I came, and I’ll continue being happy enjoying streams and helping protect them. We do need more anglers in the water, now and in the future, to either find a bird to save, or a stream to conserve. 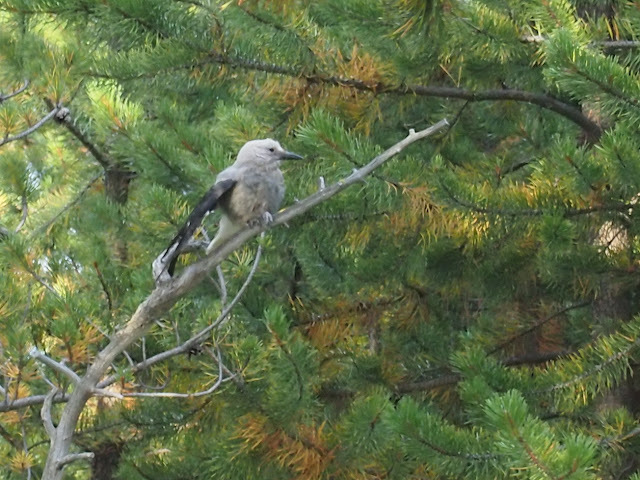 According to this website, “The high-elevation whitebark pine stands of Montana and the entire Rocky Mountain West would not exist were it not for this cone-cracking, seed-caching bird.” http://fwp.mt.gov/mtoutdoors/HTML/articles/portraits/nutcracker.htm Happy he’ll be able to plant some more trees in his lifetime. What a sad story, but at least it has a happy ending. Good job saving the bird, Daniel. This is interesting. Isn’t it funny how we are ok to hook and tire out fish, causing them pain, and treat them roughly (by dragging them in on a line and hook) for our own enjoyment, yet if someone did the same thing to birds we would probably cry about how awful it was. Imagine; a sport called birding where the birder tricks a bird with a fly and hook, or even some form of ‘bait’ – then hang on for the ride, reel it in, tire it out – and then because we care about the bird, and the numbers of birds in the ecosystem, we release the bird and feel good about ourselves. Most of us fishermen would not do this – yet we do the same thing to fish all the time. Why? Is it because we can’t see the fish, so we don’t see their suffering and therefore don’t feel as guilty? Sometimes I wonder if we should only fish with hookless flies when we are fishing for fun, and switch to hooked flies when we are fishing for meat and effectivly hunting our prey. Hookless flies would give us the rise, the strike, and we wouldnt hurt the fish in any way. Indeed, Jack, I thought about the irony of the empathy I felt for the bird and the “lack” of it when I’m catching fish. But, I am certain I’d feel the same if I found a fish that had been hooked and was trapped by a hook underwater for a period of time. I have felt awful on the occasions when I saw a dead fish under water, the likely result of an angler who didn’t release it properly. It’s certainly an interesting paradox we live in. “Mind your mono” (and someone else’s) and “pack it out” ought to be the honor bound philosophy of anyone seeking respite in nature. There is nothing more disturbing to a naturalist than seeing a hung bird or a strangled duck. The short line/tippet, close quarter casting, and fly-only techniques of tenkara are already in the right direction and converting “long-liners” could have measurable effects. Mono minders and my favorite, the thermometer/ keeper combo are handy and much surer than stuffing a pocket. I small stream side twig wrapped tightly before pocketing is OK too. Yesterday my wife and I released a female Scarlet Tanager after a week of rehab due to a damaged air sack from the number one cause of all bird mortality…window strikes. (http://www.sibleyguides.com/conservation/causes-of-bird-mortality/) The bird silhouettes on large pieces of glass are pretty effective and I would urge all conservation minded to consider these silhouettes which can be simple painted or cutout patterns or nearly invisible ones (duncraft.com). If a bird is stunned, protect it by covering or capturing with a box and leave it alone and quiet. If it does not recover and fly within one hour, take it to a federally licensed bird rehab unit; do not attempt to feed the bird yourself. As Daniel intuited, stress can be an immediate cause of death. Every human has enormous and daily impact on nature. It is unavoidable. However, as you imply Daniel, it is the balance we strike in favor of conservation and restoration that will save our planet…one bird at a time. I thought about refraining from comment because I’d just be echoing all the comments that came before but this is too important a message to ignore. Thanks for sharing and I commend you. I’m a different Jack than the Jack who posted above. I first read about this in Ashley’s Learn Tenkara blog (Ashley, thank you). Questions will always arise about karma, eating life so that we might live, and right livelihood. As we wrestle with these questions, in the meantime all we can do is to try the best we can when situations arise. And then to be gentle with ourselves when we’re not perfect. Compassion, intention, and caring are so important. So, Daniel, thank you. I never really thought about the barbs in relation to other wildlife. I recently started going barbless for all flies mostly for the sake of my own fingers, but since I usually catch and release I wanted to do less damage to the fish. Interesting and enlightening story, and a cheer for your dedication and spirit.